3D printing is taking over all aspects of innovation and research. This technology’s contribution to prototyping and to slashing the time required for a product to reach the market is something everyone is taking notice of and rightly so. Right from 3D printing skin tissues using bio-ink to prototyping in defense, architecture, medical implants, and even art, this technology is making its presence felt at a global level. How can India be left behind in this revolution? Divide By Zero, a Navi Mumbai based 3D printer manufacturing company founded by Swapnil Sansare and Neeti Sansare, are showing the world how India does 3D printing. Divide By Zero has been actively supplying both global and local enterprises with a whole range of industrial grade 3D printers. Apart from this, the Indian 3D printing experts are also the pioneers of the patented Advanced Fusion Plastic Modeling (AFPM™) technology which delivers Selective Laser Sintering (SLS) grade output strength at prices lower than FDM 3D printing. The AFPM technology is already incorporated the Aion 500 & Aion 500 MK2 3D printers manufactured by the company. With testing and ameliorating done so quickly, it’s obvious that both large enterprises and SMBs/SMEs are seeking Divide By Zero’s 3D printing solutions more and more. And why not? The possibilities with these powerful machines are endless! In the spirit of the Make in India initiative, Divide By Zero is the first Indian 3D printer manufacturing company to export machines across the Indian borders to countries such as Malaysia, Sweden, and Dubai. Divide By Zero has collaborated with multiple big names in the field of automotive research and development, such as Tata-Ficosa, SMR–Motherson, Mahle-Behr, Magneti Marelli, Advik Hi-tech, Prettl Automotive among many others. Apart from providing 3D printing technology, Divide By Zero goes one step further and also provides training options to the buyers as well as strong post-purchase support. For its commitment towards the automotive sector, Divide By Zero was awarded the prestigious 3D Printing World Award 2017 for being the 3D Printer Manufacturer of the year 2017, thereby recognising their excellence and contribution in the Automobile and Engineering and Tool Design. The award commended the AION 500 industrial-grade 3D printer’s forte in increasing assembly line efficiency and overall cost reduction in automotive engineering. 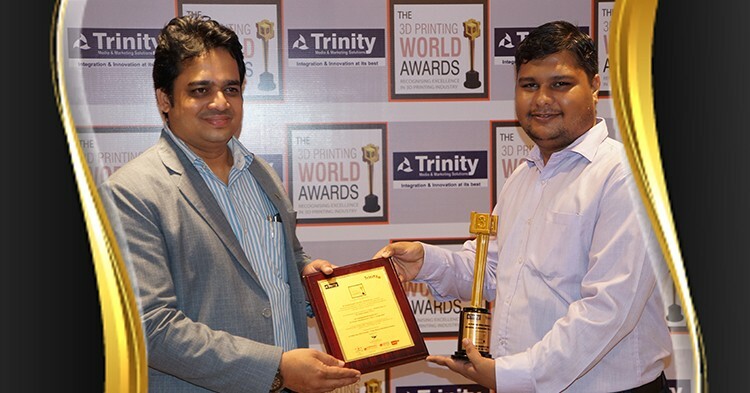 The award is presented by Trinity Media & Marketing Solutions, the company behind 3D Printing World Expo, 3D Printing World Think Board, 3D Printing World TV, 3D Printing World News Express, 3D Printing World Awards and 3D Printing World School. This is another feather in Divide By Zero’s cap and they are beaming for all the right reasons. Apart from the 3D Printing World Award 2017, earlier this year Divide By Zero’s AION 500 MK2 was awarded the prestigious I Mark award in the ‘Industrial Equipment Category’ at India Design Mark 2017 – an award is instituted by the India Design Council in cooperation with the Japan Institute of Design Promotion. We would like to take this opportunity to thank the awards committee for recognizing our efforts and our partners and employees for relentlessly playing their part in our success. As India’s leading industrial-grade 3D printing manufacturers, we regularly share useful 3D printing and additive manufacturing tips, tutorials, and other interesting editorial. Join us on our expedition to revolutionize the 3D printing technology by staying in touch with us via our blog and social channels. Also, do check out our interesting case studies and free-to-download whitepapers here.